The CASE office has moved to Biloxi, Mississippi, for the week! We have been talking about our annual fall conference now for the last few months and all that work has paid off! Over 45 states will be represented this year. I am sad to say for the first time in many years, we do not have any Canadians attending! I hope next year we will have some Canadian presenters in Louisville! I want to give an especially big thank you to Kindel Mason who put in hours of work on this conference from the call to proposals to the amazing App. Though a very important family event is keeping him from physically being in Biloxi, his finger prints are all over the conference. He has designated past president Gary Myrah to be the onsite trouble-shooter and Carrie Turner, Technology and Communication chair to oversee the App on site. He also has a very capable Professional Development committee who have turned out in mass to be the AV and all-around helpers during his absence. We hope you will mark your calendars now for the 30th annual conference next year Oct. 27-29 at the Galt House, Louisville, Kentucky. We will be doing a joint conference again with NASDSE. We believe the call for proposals will be coming out in February. It will be first announced here in this article so watch closely! Tomorrow is Election Day — if you have not voted early, I hope you WILL vote! CEC is providing you with our nonpartisan voter education guide: I Educate, I Participate: 2018 Midterm U.S. Congressional Election Voter Education Guide. Its purpose is to provide you with a one-stop shop for information and resources to help guide you during this election season. In this guide you'll find information on candidate positions, upcoming town hall meetings, resources on voter registration, voter deadlines, finding your polling place, CEC's policy priorities and k-12 lesson plans for the classroom. Be sure and download your guide today and use it! We had another great turn out on our poll this week. The question was, "Who in your district is trained on Due Process procedures?" First place with 58 percent was only special education administrators. Second place with 17 percent was only administrators. Third place at 13 percent was all the above. Coming in fourth with 8 percent was a very surprising none! And last with 4 percent was special education teachers. 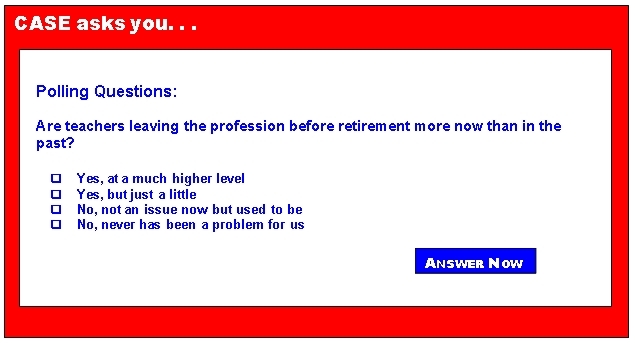 I must tell you, I am hoping the folks who answered no one was trained in Due Process just read the question wrong! In my opinion, the more people who are trained, the less likely you are to have to go to a Due Process hearing! 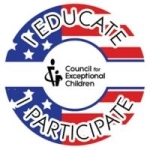 Below is the most recent issue of the CADRE Caucus, a news update from The Center for Appropriate Dispute Resolution in Special Education. If you are not using the great resources from CADRE, I hope you will look through the issue and start sharing the resources with your staff! We will have some of the CADRE staff with us in Biloxi, Mississippi, both at our CASE Board meeting and in breakout sessions. A well-trained staff will better meet the needs of all students. Again, I am hoping you have all voted early or will make the time to go vote on Tuesday. I hope you have made sure your staff are all registered to vote and know it is an important part of our responsibility as a citizen of this country to vote! Have a great week and watch our Facebook page and twitter account for the low down on what is happening in Biloxi, Mississippi. Remember, if you don't "TWEET" you can still be in the know but going to the CASE website and see the tweets on our homepage! These courses provide families and educators with strategies for working together and through conflict. Anyone supporting children or youth with disabilities may benefit from this series, however, the setting in which collaborative problem-solving and conflict resolution takes place within this series is typically the school or IEP meeting. A facilitator guide and other materials will go along with each course to offer additional learning opportunities. Materials will be posted as they are developed. You can access Working Together through the website. As a follow-up to their live webinar, Skilled Dialogue: Minding and Mining the Riches of Differences, Drs. Barrera and Kramer dive deeper into specific skilled dialogue strategies through example scenarios and explanations of collaborative language. CADRE's Part C Family Guides are now available in Spanish! 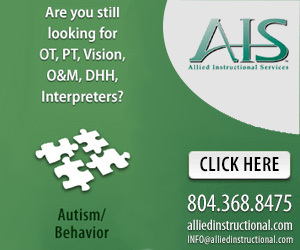 Along with the translated guides, CADRE has created a Spanish language webpage featuring the four Family Guides, IDEA Early Intervention Comparison Chart, common terms, and additional information about due process procedures for Part C.
Check out our IDEA Early Intervention Family Guides Spanish webpage. As a part of their Early Childhood Equity resource page, the Western Educational Equity Assistance Center has created some videos that discuss parent engagement as a means of promoting equity in early childhood education.